Facing an early departure on Saturday morning for Seatac Airport, and with the daunting chore of packing for a week in Olympic National Park ahead of me, I did not want to depart from the Taylor River any later than 3PM. Danny and I quickly downed our lunches back at Lottis Creek Campground, took down the tent, and packed everything in the car. We were now anxious to return to the Taylor River for some action similar to that experienced on Thursday. I drove to the same pullout used on Thursday, and we once again agreed to cross to the north side of the river, but unlike the previous day, we made a left turn and followed the river downstream through the woods to a point directly across from the Lodgepole Campground and parking lot. On Friday we crossed the river where the four fishermen blocked our path on Thursday, and this proved to actually be more challenging than the upstream route. Big clouds raced across the sky, and this condition combined with a strong wind to create a cool environment for fishing. I began with a Chernobyl ant, beadhead hares ear, and salvation nymph since the nymphs produced for me the previous day. Unfortunately Friday was a different day, and I went quite awhile without any action. Since the Chernobyl was not generating any interest, I decided to exchange it for an equally ignored top fly, the yellow Charlie Boy hopper. The Charlie Boy offered the advantage of being more visible and buoyant. I also added length to my droppers as a concession to the higher flows below the dam in an effort to achieve deeper drifts. I continued fishing without success after these adjustments until I observed one lonely green drake fluttering up from the surface of the water. Since the dry/dropper strategy was not working, I clipped off the three flies and tied on a parachute green drake. 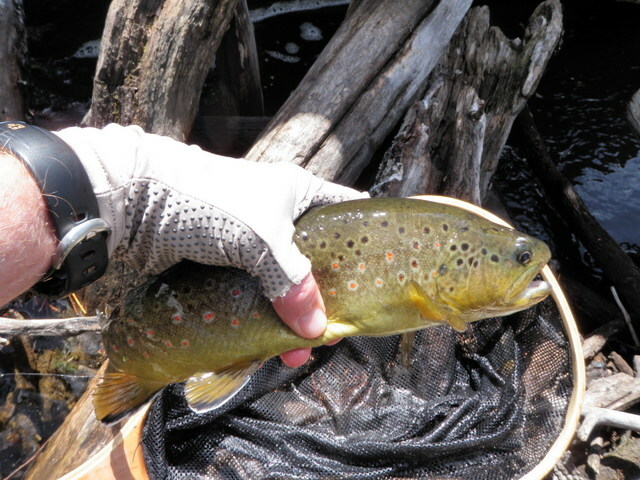 Finally at the tail of a huge hole below a large boulder that created a massive drift log dam I managed to induce a small brown to inhale the big green drake. An afternoon skunking was prevented. The top and middle of the huge deep pool failed to generate any interest despite quite a bit of casting so I moved on to a miniature version of the large pool. A smaller boulder jutted out from the bank and created a pool and trapped drift sticks between the bank and the boulder. Just above the stick dam a very nice riffle of intermediate depth flowed over a rocky bottom. The riffle was approximately twenty feet wide, and I began drifting the parachute green drake over this area starting with the shallow water on the left and gradually sprayed casts to the right. As the large dry fly drifted down the center of the riffle, a feisty fourteen inch brown rose and confidently sipped in the fake morsel. I fought the fish carefully to keep it out of the stick dam and eventually netted and photographed my best fish of the afternoon and day. My spirits soared as I felt confident that I had found the key to success on the lower Taylor on Friday afternoon, but unfortunately my enthusiasm was misplaced. As I played leapfrog with Danny, I began generating refusals to the green drake and started an endless series of fly changes in hopes of discovering the magic potion that would improve my fishing success. I began with a green drake comparadun, and that produced refusals similar to the parachute. Perhaps the shape was correct, but the fly was too large? Next I knotted a gray comparadun to my tippet, and it was completely ignored. It was quite windy and some tiny blue winged olives began to tumble rapidly across the surface, but I elected to return to the Charlie Boy hopper, hares ear and salvation in hopes of replicating my success of the previous day. Alas it was a different day with different conditions, and 3PM quickly appeared on my watch. I probably should have tried a RS2 or soft hackle emerger when I spotted the wind blown BWO’s, but hindsight is always 20/20. 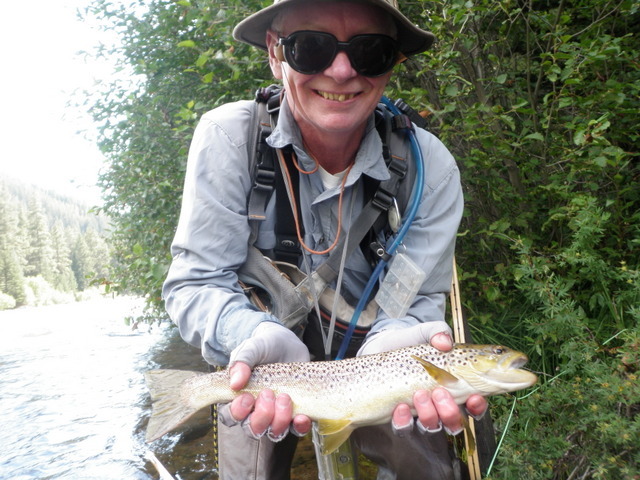 I’ve experienced similar conditions on the Taylor River tailwater where I was unable to catch fish during decent hatches, but then enjoyed hot action after the emergence ended. The difference on Friday was that we needed to depart before this scenario could play out. Fortunately Thursday was a solid day and the upper Taylor produced two hours of fun, so the frustration of Friday afternoon will fade in my memory banks. The campground was excellent, the scenery was a sensual delight, and Danny experienced new water. I was off to Olympic National Park and the adventures it might cast my way. Location: The second stretch of public water beyond Taylor Reservoir and upstream. After a pleasant evening at Lottis Creek, Danny and I woke up ready for another day of fishing on the Taylor River. We agreed to sample the upper Taylor River above Taylor Reservoir in the morning, and then adjourn to the tailwater section for the afternoon. It was quite cool as we departed at 8:30 to begin our Friday fishing adventure, but once the sun rose higher in the sky it would become a pleasant day with high temperatures in the low 80’s. On our way to the upper Taylor, we passed the famous Hawg Trough, so we stopped so Danny could sample it. Once he spotted a few hawgs wallowing in the area above the bridge, he decided to accept the challenge of hooking one of the educated behemoths. I elected to be a spectator as the air temperature remained in the 40’s in the shade of the canyon walls, and I was not ready to acquire a chill on a summer morning. Danny rigged for nymphs and tried all manner of subsurface offerings for a half hour or so, and did manage a couple lip pricks, but no landed fish. After being adequately teased by the leviathans in the trough, we decided to cut our losses and moved on to the upper Taylor River. ATV’s were everywhere and small informal campsites were scattered across the sagebrush as we approached the first dirt lane that accessed the lower end of the second stretch of public water above the lake. Once we were geared up, we walked briskly across the sagebrush flat to the very bottom boundary of public water, and here we began to prospect the twenty-five foot wide stream with dry/dropper combinations. I started with the same yellow Charlie Boy hopper that served me on Thursday and then added a beadhead hares ear and salvation nymph on droppers 2.5 feet below the hopper. 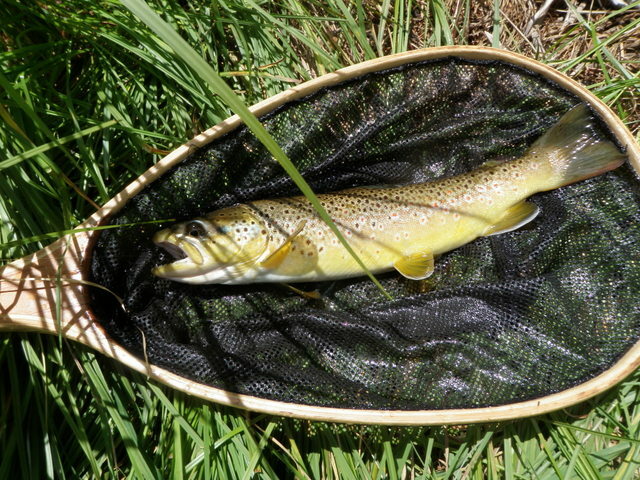 Fifteen minutes passed, and my hopper dipped, and I landed a nice thirteen inch brown. 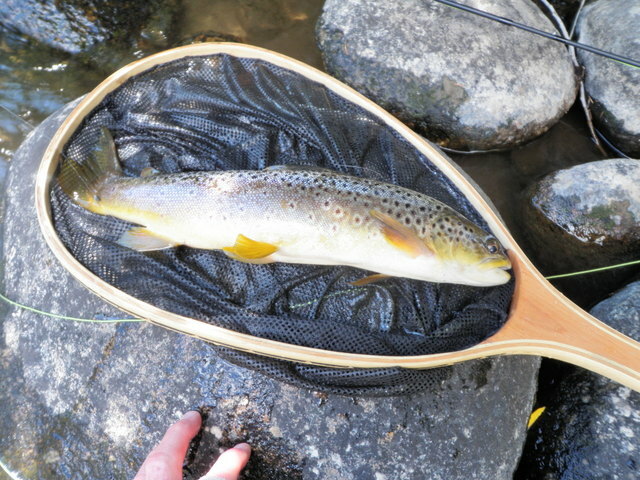 Shortly thereafter a bit further upstream a similar sequence played out, and I netted a second fine brown in the thirteen inch range. I would eventually learn that both of these fish were the nicest of the morning, and they inhaled the salvation nymph. 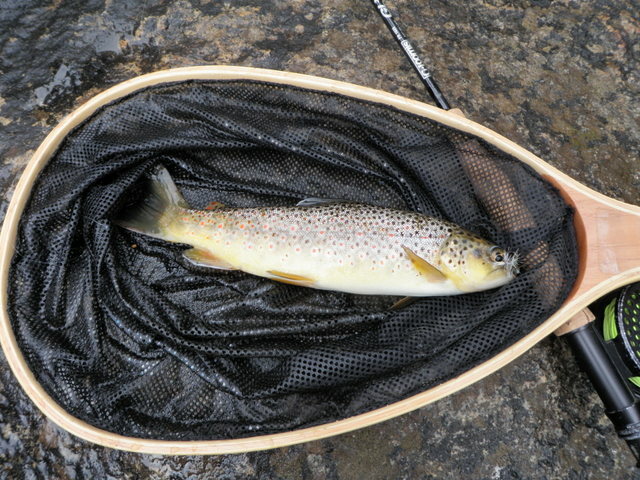 The fishing slowed down after the first half hour, but I continued upstream and covered quite a bit of water and landed six more smaller browns. Two were fooled by the beadhead hares ear, and halfway through the morning I exchanged the salvation for a beadhead pheasant tail. This move paid dividends as the last four fish attacked the pheasant tail as I imparted movement to the fly early and late in the drift. I am guessing that the fish were tuned in to PMD nymphs moving in the current in advance of a hatch later in the day. After two hours of fishing, Danny and I each landed eight fish, and we decided to return to the Taylor tailwater. I covered quite a bit of water during the morning and had decent success, and I discovered that the deeper runs and pools produced most of the fish. 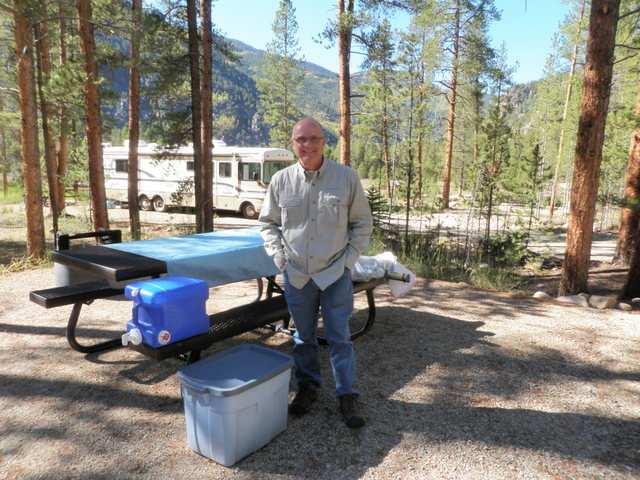 We threw our gear in the Santa Fe and drove back along the dirt road that skirted the reservoir and stopped at Lottis Creek to eat lunch and pack up the tent and camping gear. I picked up Danny at 7:30 on Thursday morning, and we were on our way for a two day and one night camping/fishing trip to the Taylor River. The Arkansas River received additional rain on Sunday night, and despite optimistic reports from the fly shops, I didn’t trust the conditions to provide a positive experience for Danny. The Taylor River is a bit further, but is a tailwater and thus presented a more reliable option. 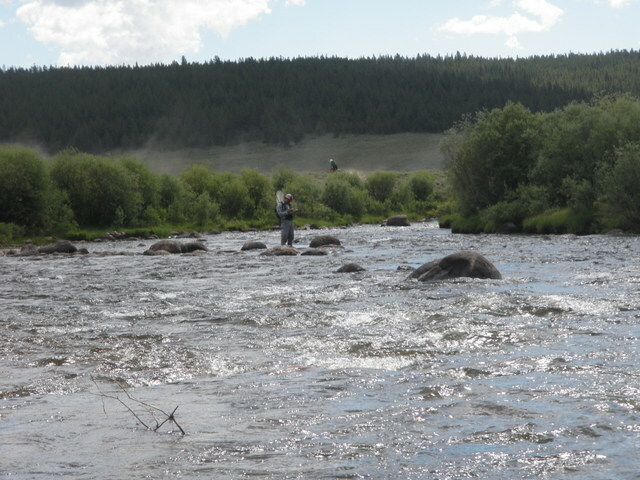 Flows were hovering around 400 cfs, and based on past experience, that is a bit high yet still comfortable for fishing. 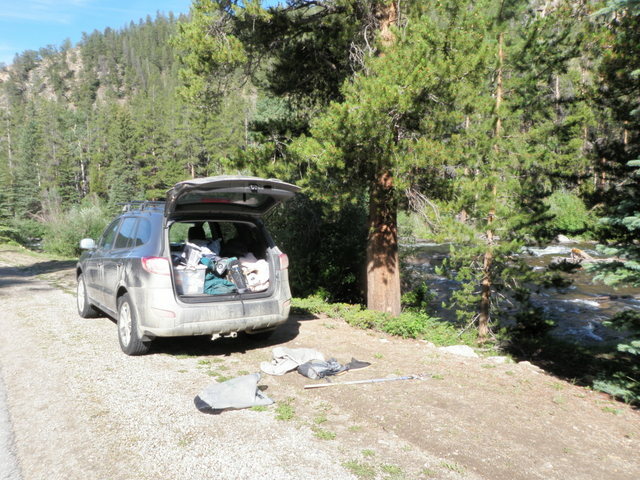 We arrived at the Lottis Creek Campground by 11:30 and unloaded a few items to secure our site and then munched quick lunches and headed back to the river. 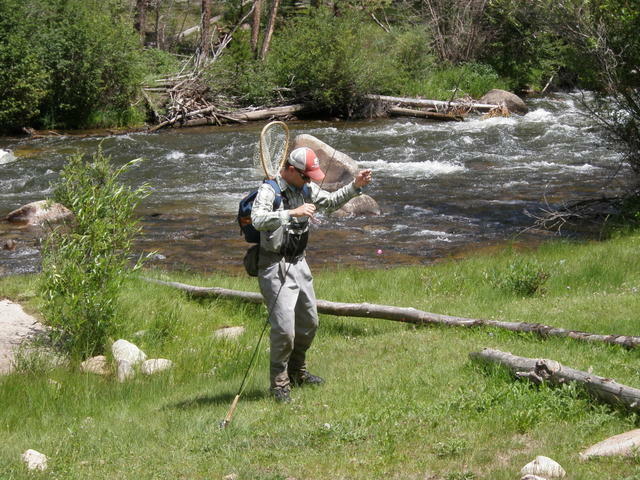 I immediately targeted the section of the river above Lodgepole Campground, as I have enjoyed previous success there, and I knew lots of public water could accommodate two gung ho fishermen. It was quite cool with high temperatures in the 60’s and heavy clouds floated across the sky 60% of the time we were fishing. It was actually quite ideal weather for fishing and fish. As Danny and I began to fish in the pocket water next to the car, we immediately observed a fair number of green drakes followed by some pale morning duns, but these mayflies waned after an hour. I elected to begin fishing with a parachute green drake, and Danny opted for a nymph set up that included his newly tied tungsten red San Juan worms. I worked my way along the right bank with my green drake and landed four browns in the first hour including a 14 incher that I spotted just in front of a submerged rock. I returned to tell Danny the green drakes were producing and shared a parachute style and comparadun style with him. 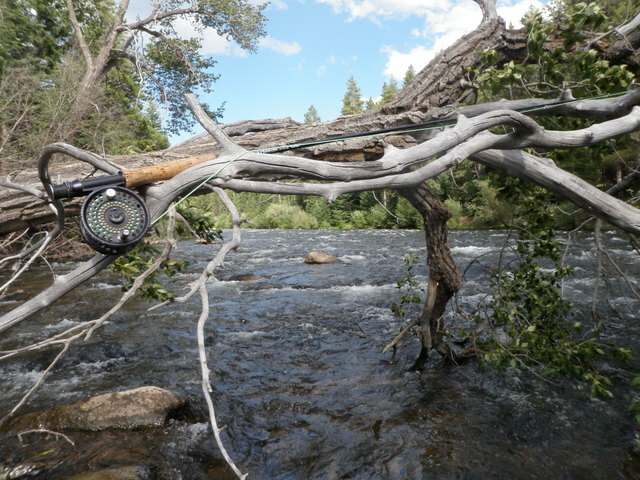 We continued fishing along the bank that bordered the road until we reached a point where the river narrowed and crashed through a whitewater chute, and here we turned around and reversed our steps to the car. We both looked longingly at the opposite bank with full knowledge that it hadn’t been fished much since the inception of runoff. There was one wide riffle spot where a crossing might be possible, but four fishermen were positioned in this area, and it would not have been mannerly to cross while they were fishing. We quickly reversed course again and found another wide spot below a huge protruding boulder in the middle of the river. This ford seemed possible, although there was a fast deep run within ten feet of the north bank. Since I’m here to write this blog, it is evident that we pulled off the crossing, although it happened with a few scary moments. As was the case with the fishing next to the road, Danny and I took turns leapfrogging around each other as we covered the best pockets and pools within 20-25 feet of the bank. I switched from the green drake to a parahopper with a beadhead hares ear and landed four small browns as we progressed upstream over the hour from 2PM to 3PM. At that time I switched the parahopper for a large yellow Charlie Boy hopper with long dangling rubber legs, but that fly did not last long before I exchanged it for a smaller Charlie Boy and added a salvation nymph below the beadhead hares ear. 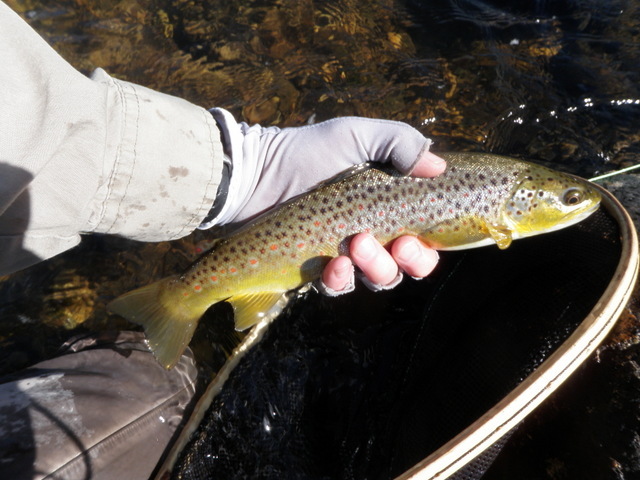 At 3PM I suddenly began to catch fish with increased regularity primarily on the salvation nymph and some of the brown trout extended into the 12-13 inch range. 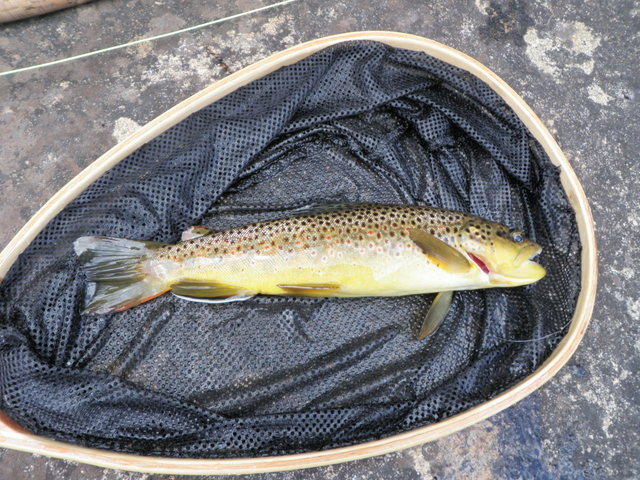 As the afternoon advanced it seemed that the fish got larger with numbers eighteen and nineteen falling in the 13-14 inch range, and for some reason the fish landed later in the day fell for the beadhead hares ear rather than the salvation nymph. Near the end of our fishing I approached a nice deep run towards the middle of the river, and I positioned myself 10-15 feet to the left of it and one fourth of the way up from the tail. The current divided around a large boulder and created a thirty foot long slick that was only six feet across at its widest point. 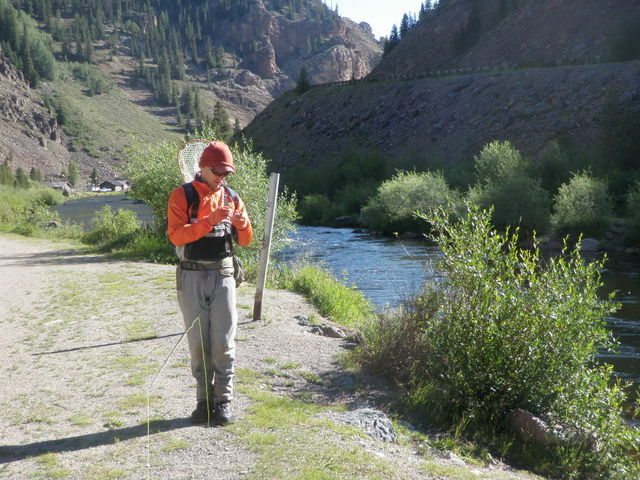 I began drifting my three fly combination starting toward the middle and covering the tail section, and I had the unique feeling of confidence that comes from many years of fly fishing and recognizing water that delivers on high expectations. It wasn’t long before I saw a fish emerge from the cover of the faster deeper current seam, and I instinctively set the hook and felt myself attached to a gorgeous rainbow trout. The powerful pink-sided fish flashed up and down the narrow pool a few times, and I maintained solid pressure, but then it did an abrupt turn and streaked for the whitewater below. 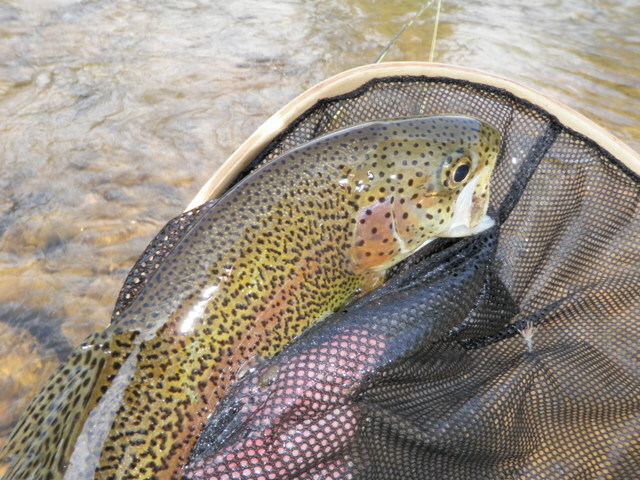 I tried to allow the line to slide through my hands and spin off the reel, but I failed and felt a knot in my stomach as the rainbow made another quick turn and snapped off the salvation nymph. I paused for a moment to collect myself and then tied a new salvation to my line below the hares ear and resumed casting. 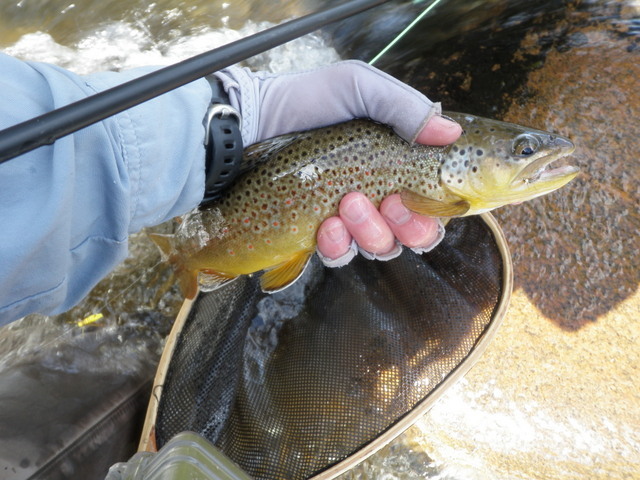 I moved up the river a few steps and began prospecting the midsection of the narrow pool, and after a few casts, the hopper paused and dipped, and I once again set the hook and felt decent weight on the end of my line. 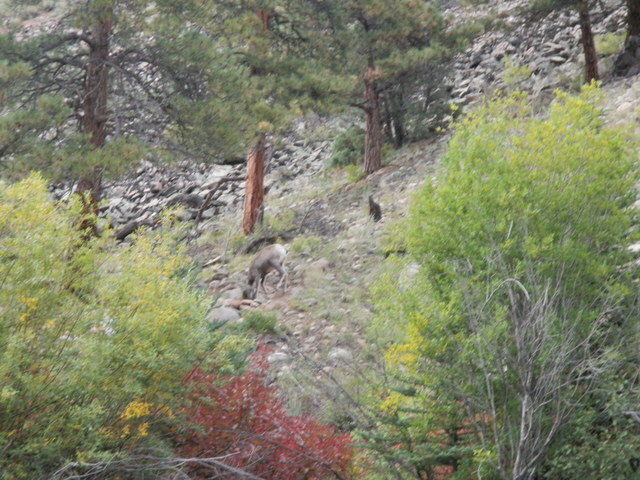 By now, Danny had moved on to the bank and was just above me. I fought the bruiser back and forth and prevented it from charging into the fast water. 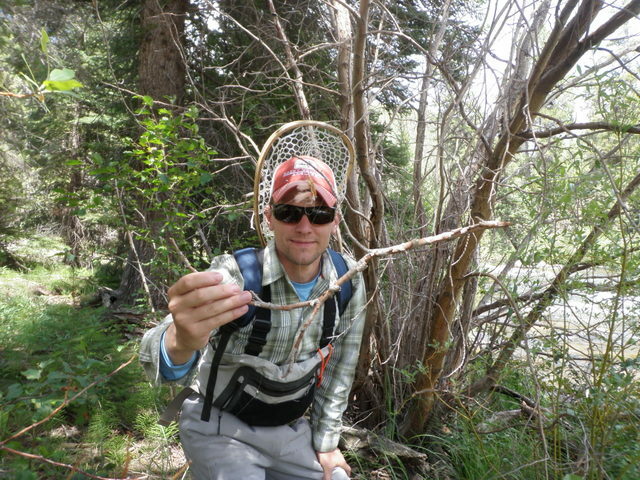 I bought enough time for Danny to wade below me, and after I pressured the brown toward the bank, Danny scooped it into his large long-handled net. It was just in time as the fly fell from the seventeen inch brown’s lip just as Danny lifted it from the water. 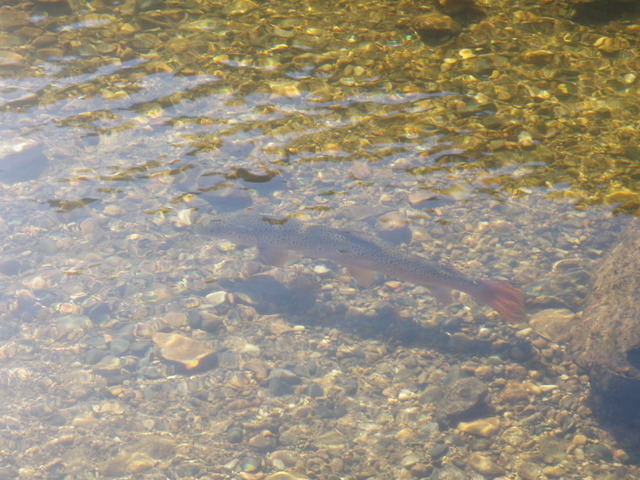 We paused to photograph the last and best fish of the day before tackling another adrenalin generating crossing. 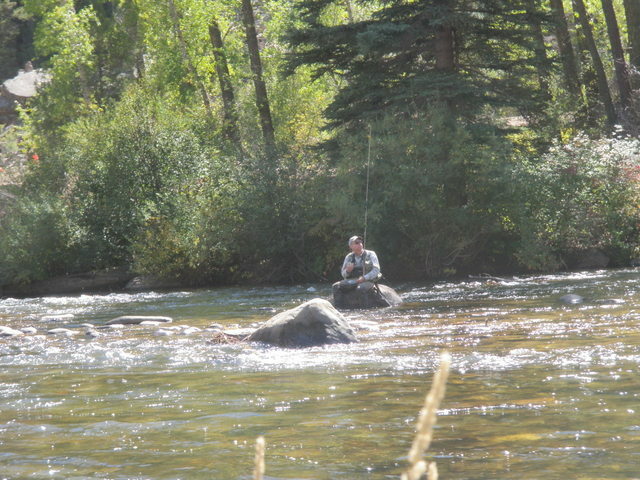 We had a fun afternoon of fishing and looked forward to a full day on the Taylor River on Friday.